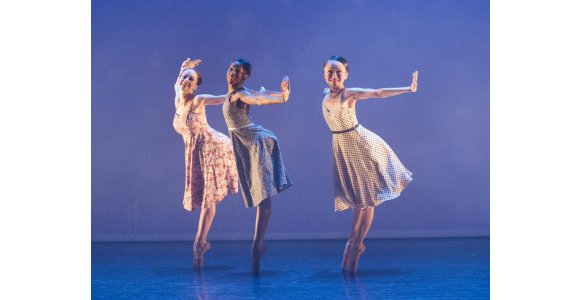 Ballet Black was founded in 2001 to create opportunities for dancers of black and Asian descent. Since then, it’s established its own niche as a sparky, award-winning company, with a spirited policy of commissioning new ballets. The focus on new work has meant we don’t often see these dancers on the formal side of ballet. Pita’s work, his first for the company, is also its first tutu ballet. After The Metamorphosis, his award- winning adaptation of Kafka, Pita’s star is rising. This time, he draws on the themes of A Midsummer Night’s Dream, without sticking to its plot. Three couples dance a classical setpiece to Handel, moving with courtly authority. Just as they’re reaching a solemn finale, Puck pops up and throws the switch, pitching the dancers into a starlit dreamworld of kitsch pop and unexpected pairings. Isabela Coracy’s larky Puck, cross-dressed in a Boy Scout uniform and flowery beard, is in charge of this particular dream, with no sense that he’s acting on Oberon’s instructions. Sayaka Ichikawa’s Helena stays primly classical as Demetrius and Lysander (José Alves and Jacob Wye) shimmy into mambo moves; she finally wards them off with some killer fouetté turns. Pita then pairs her off with Kanika Carr’s free-spirited Hermia. The crisp, springy footwork recalls the perky solos of 19th-century ballet, but here becomes delighted lesbian flirting. There’s a real bounce and freedom to these dances, and a surprising tenderness to Cira Robinson’s lush duet with Alves, now playing a donkey-eared Bottom. Jean-Marc Puissant’s designs illustrate Titania’s shift from regal to sensuous, while a rainstorm takes over the soundtrack. Damien Johnson’s Oberon dances lyrically with Wye’s Indian Boy. They’re all whisked back to finish their finale, but these fantasies have shown where their hearts lie. Two more new works stress Ballet Black’s classicism. Martin Lawrance’s Limbo, danced to Hindemith, is strongest in its solos. Robinson shows a terrific sense of speed and power, opening out her long limbs at the end of a turn. Joined by Alves and Wye, they share glances and a sense of waiting. David Plater’s lighting cuts paths of light overhead, then shifts to spotlight Jacob Wye, who dances with swooping arms and quick attack. Lawrance’s theme of limbo could be developed more, but he shows off the dancers’ footwork and line in fast, polished dances. Christopher Marney’s Two of a Kind sandwiches Tchaikovsky and Ravel together for lots of floaty, romantic pas de deux. Marney could do with more discipline: the switch of composers is jarring, and he throws in too many lifts. Still, it’s fluent and fluid, and danced with assurance by Carr, Ichikawa, Johnson and Christopher Renfurm.